Unknown gunmen killed five people belonging to Pakistan’s minority Hazara community, as they opened fire in Quetta’s Bacha Khan Chowk area on Sunday evening. Police said that the assailants escaped the area, which soon turned into a ghost-town as panic gripped the streets. Shops and outlets closed their doors, traffic disappeared, and soon after, 500 protesters took to the streets to protest the indiscriminate killings. The gravity of the situation is evinced by the fact that half a dozen Hazaras have been killed in similar fashion in Quetta in the last few days alone. In the most recent incident, two Hazara men who own a cloth shop were gunned down, before which three people belonging to the Hazara community were gunned down in a separate attack. The attacks, although brutal, are by no means a rare occurrence in Pakistan, which is gaining a notorious reputation regarding the safety (or rather lack of) of the country’s minorities. Shias — which include Hazaras — are the worst targeted. In the last few months, suicide attacks on Shia mosques in Peshawar and Shikarpur killed dozens of people. The attack on the Shia mosque in Shikarpur in fact is the deadliest sectarian attack in Pakistan in over a year, claiming 60 lives. In fact, a Human Rights Watch (HRW) report released a few months ago said that the half-million members of the Hazara community — a Shia minority — in Quetta live in fear, compelled to restrict their movements, leading to economic hardship and curtailed access to education and employment, the report says. This oppressive situation has prompted large numbers of Hazara to flee Pakistan for refuge in other countries. Previously, HRW recorded at least 450 killings of Shia in 2012, the community’s bloodiest year; at least another 400 Shia were killed in 2013. While sporadic sectarian violence between Sunni and Shia militant groups has long persisted in Pakistan, attacks in recent years have been overwhelmingly one-sided and primarily targeted ordinary Shia going about their daily lives. The Hazara in Balochistan, numbering about half a million people, find themselves particularly vulnerable to attack because of their distinctive facial features and Shia religious affiliation. More than 500 Hazaras have been killed in attacks since 2008, but their precarious position is reflected in the increasing percentage of Hazara among all Shia victims of sectarian attack. HRW notes that approximately one-quarter of the Shia killed in sectarian violence across Pakistan in 2012 belonged to the Hazara community in Balochistan. 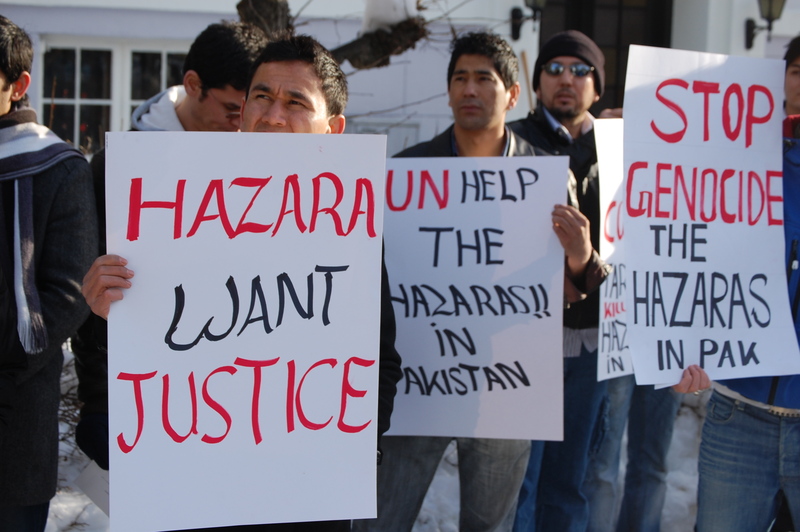 In 2013, nearly half of Shias killed in Pakistan were Hazaras. Shias constitute 20 percent of the national population. In January 2014, a bomb targeting a bus of Shia pilgrims returning from Iran in Pakistan’s troubled Balochistan province, resulting in 22 casualties, was a recent reminder of the erosion of the country’s plural fabric. According to a 2014 HRW report, 400 Shias were killed in 2013 in targeted attacks across Pakistan. At least 200 Shias, mostly from the Hazara community, were killed in Balochistan in and around the provincial capital of Quetta. In January 2013, a suicide bomb killed 96 Hazaras and injured at least another 150. In February 2013, a bomb in a vegetable market in Quetta’s Hazara town killed 84 and injured 160. In March 2013, 47 Shias were killed and 135 were injured in Karachi when a Shia-majority neighbourhood was targeted. It is not just Shias that are targeted. Ahmadis — who consider themselves Muslim, but are categorised as non-muslim under the constitution for disputing the claim that Prophet Muhammad was the last messenger of Islam — face routine attacks. The community has been banned from mosques in Lahore as groups accused them of “posing as Muslims.”One of the most violent attacks against the Ahmadis was in 2010, when Taliban insurgents attacked two Ahmadis mosques in Lahore killing more than 85. In addition to violent attacks, the minority sect is often targeted by the use of the blasphemy law against them, a recent example being the arrest of Masood Ahmad, a member of the Ahmadi sect, after he was secretly videoed reading a translation of a verse from the Quran earlier this year. In March this year, two people were killed in a blast that took place during Friday prayers outside the Saleh Mosque for Bohra community worshippers. Non-Muslim minorities are also often targeted, with temples for Pakistan’s small Hindu community being vandalised, disputes plaguing property, and forced conversions being increasingly reported. For instance, in July 2010, around 60 members of the minority Hindu community in Karachi were attacked and evicted from their homes following an incident of a Dalit Hindu youth drinking water from a tap near an Islamic Mosque. In January 2014, a policeman standing guard outside a Hindu temple at Peshawar was gunned down. Christians in Pakistan are also under threat. In March this year, a Taliban attack on two churches in Lahore that killed 15 people and injured over 70 others. Another recent incident was the brutal burning alive of a Christian couple in a brick kiln in Kot Radha Kishan for allegedly desecrating pages of the Holy Quran. The woman, mother of three, was pregnant. These attacks are the basis of reports that indicate that sectarian violence is increasing in Pakistan. A report by the Pakistan Institute of Peace Studies (PIPS), the “Pakistan Security Report 2013” traces this rise in sectarian violence to 2011, from when it has steadily increased every year. According to a database maintained by the South Asian Terrorism Portal (SATP), although the incidents of sectarian violence attacks have declined in Pakistan, the lethality of attacks have increased leading to more deaths. SATP recorded 128 sectarian attacks, resulting in 525 deaths in Pakistan through 2013, as compared to 173 such attacks and 507 killed in 2012, demonstrating a substantial rise in lethality, from 2.93 to 4.11 fatalities per attack. According to the United States (US) Commission on International Religious Freedom (USCIRF) report titled “Violence towards Religious Communities in Pakistan”, published in August 2014, over the one-year period from July 2013 to June 2014, at least 430 people were killed in a total 122 attacks against minorities. These include 222 Shias in 54 attacks; 128 Christians in 22 recorded incidents; 10 Ahmadis in 10 such attacks; and two Sikhs in three attacks. Four attacks were recorded on the Hindu community in this period, with no fatality reported. 29 attacks resulted in 68 fatalities among other religious/sectarian groups. The problem with data sets relating to violence in Pakistan is that they are largely provisional based on newspaper reports, and hence, there is variation in the numbers. That said, the security situation in Pakistan does seem to be reflecting a dangerous trend toward the worse, no matter which data set is employed in the analysis.